Ioanna Studios & Apartments are consisting of 3 buildings which situated 150m from the magnificent beach of Agios Prokopios and offer everything you need for a comfort and pleasant stay. The friendly environment and the family atmosphere, will relax you and make the days of your vacation memorable. Pets Allowed, Garden, Non-smoking Rooms, Family Rooms, Free Parking, Safety Deposit Box, Heating, Gay Friendly. Games Room, Massage, Children's Playground, Jacuzzi, Library, BBQ Facilities, Outdoor Swimming Pool. 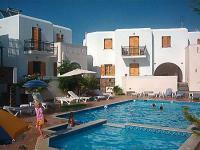 Room Service, Babysitting/Child Services, Laundry, Internet Services, Car Rental, Fax/Photocopying.